So it's not exactly a meal, but thought I'd share this on how to make bacon salt. So ... It's a recipe for a seasoning. You can use it anywhere you use salt, but you'll add the taste of bacon. It's all I'm bringing camping anymore lol. 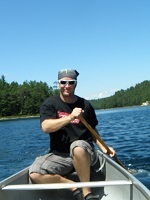 ManCamping.ca - Paddle Far, Push Your Limits. My man's going to really like this stuff. I better get frying!! Keep your paddle in the water and lean downstream! In related news, I am at this very moment making my own bacon from scratch. It's in the fridge marinating with the salt and in a couple of weeks, I'll toss it in the smoker. Oh, by the way, I have made smoked salt before. It turned out OK, but I needed to smoke it a lot longer since salt doesn't really absorb much smoke.